Stainless Steel Cookware is widely used in homes, hotels, restaurants and various other places for cooking purposes. It is designed and manufactured by using superior grade stainless steel and latest technologies under the closed supervision of our expert’s professionals. Further, our provided cookware includes saucepans, stockpots and skillets for a comfortable cooking experience. This cookware is tested on various quality parameters by quality controllers to ensure its durability and perfection in finish before delivering to our valued customer ends. Our provided Stainless Steel Cookware is known for their unique features like light weight, easy to clean, heavy bottom prevents food from burning, unbreakable and perfect sheen. 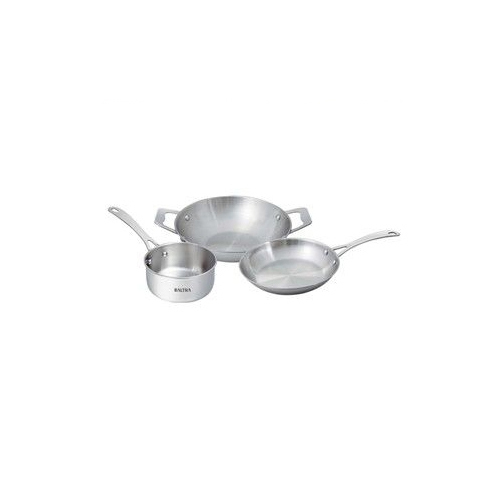 Stainless Steel Cookware, Food Grade with Induction Compatibility. 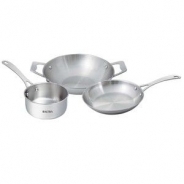 Option: Fry pan 20Cm, Kadahi 24Cm, Sauce pan 14Cm.